Â Those of us who live in the Finger Lakes region know that we have some pretty amazing wineries, and the beauty of the eleven-finger lakes surrounded by rolling hills rivals anything that can be seen in Europe or Napa Valley. Now the rest of the world is catching on. The Atlantic recently published a pieceÂ on how the Finger Lakes is the next up-and-coming region, Â especially because of its Rieslings. Caroline Helper, writing for the Atlantic, describes a wine region that’s been playing a game of catch-up with the well-established regions in California, Oregon and Washington. Helper credits the local food movement with people turning to their own communities for products and the region’s stellar Rieslings for the growing interest in Finger Lakes wineries. The Riesling, first introduced to the region in 1962 by Ukrainian immigrant Dr. Konstantin Frank, is the most planted grape in the region, according to the Finger Lakes Wine Alliance. 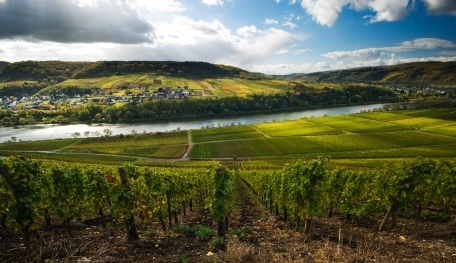 Finger Lakes Rieslings are noted for their dryness and pairing perfectly with meals. The region also earned some buzz in 2011 when famous winemaker, Paul Hobbs, an Upstate New York native, announced that he’d like to make wines in the Finger Lakes.